Proven methodology and tools to migrate configurations, data and customizations from on-premises or legacy cloud applications to cloud. System Provisioning: GoSaaS assists clients in coordinating with cloud ops to provision the appropriate cloud environments for non-production and production environments. Pre-Migration Training: Prior to having migration workshops, we have found that product training for business process owners who would be making decisions about migration to the cloud results in much better input and decisions from business process owners. 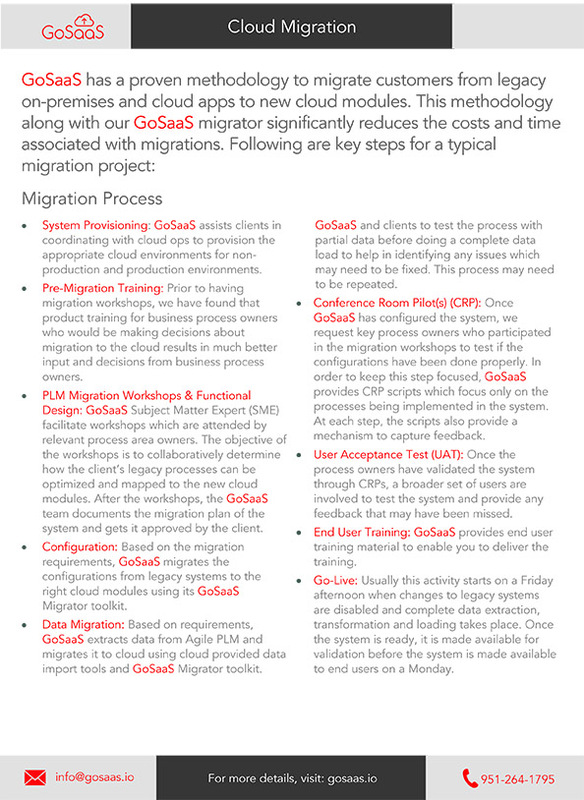 PLM Migration Workshops & Functional Design: GoSaaS’s Subject Matter Expert (SME) facilitate workshops which are attended by relevant process area owners. The objective of the workshops is to collaboratively determine how the client’s current processes can be optimized and mapped to relevant cloud modules. After the workshops, GoSaaS’s team documents the migration plan of the system and gets it approved by the client. Configuration: Based on the migration requirements, GoSaaS migrates the configurations from legacy systems to cloud system. Data Migration: Based on requirements, GoSaaS extracts data from legacy system(s) and migrates it to cloud using cloud provided import tools and/or GoSaaS Migrator toolkit. GoSaaS and clients to test the process with partial data before doing a complete data load to help in identifying any issues which may need to be fixed. This process may need to be repeated. Please see the scope section below to determine the number of data loads which are in scope. Conference Room Pilot(s) (CRP): Once GoSaaS has configured the system, we request key process owners who participated in the migration workshops to test if the configurations have been done properly. In order to keep this step focused, GoSaaS provides CRP scripts which focus only on the processes being implemented in the system. At each step, the scripts also provide a mechanism to capture feedback. Depending on the feedback from a CRP, this process may be repeated a second time “CRP-2” after making configuration adjustments. The second CRP usually also involves more real data to be available for testing. Go-Live: Usually this activity starts on a Friday afternoon when changes to legacy system are disabled and a complete data extraction, transformation and loading takes place. Once the system is ready, it is made available to key process area teams to validate the system over the weekend to make it available on Monday to end users.